TIA has many opportunities to offer your children; team sports, cultural festivals, sports camps, leadership opportunities, business programs, international trips, college tours, college and career fairs, learning events with the community and so much more. Below are some of our TIA videos that share just a touch of what goes on at our campuses. Every year all four TIA campuses come together to celebrate Chinese New Year. The students put on a performance in Chinese for family and friends to watch. TIA students perform songs and poems in Mandarin and dance traditional Chinese dances. Throughout the school year at TIA, all students K-12, study and learn to speak Mandarin Chinese. They also learn about Chinese culture and history. We live in a global society today. If you can speak English, Spanish and Chinese, you can communicate with 70% of the world population. Coach Brodie returns for the fourth year to TIA charter school, helping motivate and train TIA high school students to face their fears and move forward when dealing with challenges. This is a two-day event. On the first day, all high school students are involved in the training session. The second day focuses on the seniors, helping them better prepare for graduation, college, and work. One part of the Business Program for high school students at TIA is Business Week. On Friday of that week, the student’s interview with local businesses to get experience doing interviews for future jobs. Some of the students will be offered internships at these businesses, which gives them great job experience. Some may even be offered college scholarships. 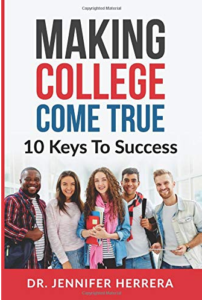 TIA helps college come true for all their students. TIA graduates Valerie and Nicolas (brother and sister) share how TIA staff helped them succeed in high school and prepared them for a successful college experience. They are both attending Northern Arizona University now. Pima County Superintendent Dustin Williams visits TIA seniors to share what it takes to be a successful student. Senior Day at TIA helps prepare the current class of seniors and their parents to prepare for upcoming life in college after they graduate from high school at TIA. Previous TIA graduates who are either in college now or have already graduated college come back to share their experiences. In February 2018, book authors and publishers, Mama and Papa Goose came from Texas to Arizona to visit and inspire TIA students. Mama Goose (in full costume) read her books with the younger students and Papa Goose shared how to get A’s in school with the older students. This was all part of the Love of Reading Month at TIA. Interview with Dr J and Mr Montemayor about TIA and 4th – 5th grade class from West Campus performing a song in Mandarin Chinese. TIA Grad Cristian talks about how he came up with his business called Project Kickz while in the high school business program at TIA in 2016. Then in 2017 with help from a program at the Tucson Hispanic Chamber of Commerce called Young Entrepreneur’s Academy, his business idea really took off. He customizes and repairs shoes for Sneaker Heads. Rubina and Monique, good friends and graduates of TIA. Both girls are attending Grand Canyon University. Both girls started businesses while in TIA’s high school business program. Both girls plan on becoming teachers after they graduate. TIA helps students build character through sports and classroom activities. TIA needs a safe area to practice different types of team sports and is looking to raise funds to create this area close to the school campus. Some of TIA’s students, parents, teachers and staff took to Japan and Australia June 2017. Enjoy the slideshow video below of the highlights of their trip. This event is held at the end of each school year. The students, teachers and families come together to share in the accomplishments of the seniors. The junior students are there so hear what their upcoming senior year will be like. They get to feel the excitement generated by the graduating class and hear advice given by the outgoing seniors. It is an uplifting and moving experience for all involved. Please watch and enjoy the video below or read this article about the event. Athletics at TIA lead to a path of being a better student and can lead to possible scholarships as well.